The PSD CODEC is a a plug-in for Windows that allows you to preview, view metadata, search for PSD files by metadata, and easily organize PSD images in Windows Explorer with thumbnails for PSD files. The PSD CODEC provides metadata, such as the Date Taken and the Camera Model, to the system so that the information can be viewed and searched. EXIF, XMP, and IPTC metadata are fully provided to the system. In addition, the codec provides Thumbnails for AI, EPS, PDF, and INDD files if they contain embedded thumbnail or preview images. Even broader support for PDF thumbnails is provided when Adobe Reader is installed. Follow the prompts in the install. Reboot your system so that the system will reload the list of codecs. Once the installation is complete, under All Programs you should have a PSD Codec by Ardfry Imaging program group which contains the PSD Preferences application. On Windows 8, Right Click on the Start screen and choose All apps to get to the list of all programs installed on your PC. Here you should find the PSD Preferences application. The codec is fully functional during the 15 day trial period. After the trial period expires, you can buy a license at http://www.ardfry.com/psd-codec/buy. When you purchase the codec, you get a registration code on the receipt and in the order confirmation email. The registration code is entered into the PSD Preferences application. Icon overlays provide a way to distinguish file types that contain the same image. An alternative way is to rely on the file extension. 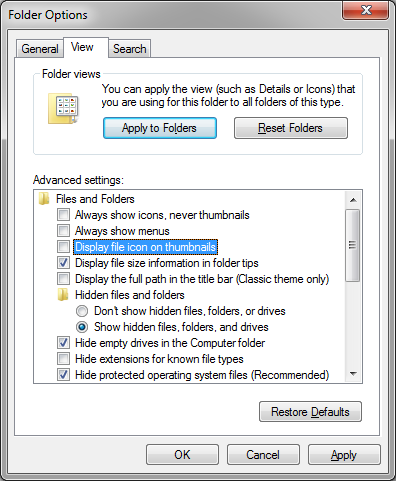 To disable the icon overlay on thumbnails so that none of the preview image is covered on the preview pane, go to the Organize menu in Windows Explorer, Folder and search options, under the View tab and make sure "Display file icon on thumbnails" is unchecked. Write to customer-service@ardfry.com. Please ensure that you don't have any spam blocking filters installed which are blocking our messages. If you maintain an incoming whitelist, then please add ardfry.com. Visit Ardfry Imaging, LLC online at http://www.ardfry.com.